Day 1 from qualifying of the TRAC North of Scotland Championships treated the local crowd to some excellent squash. It was a busy day as this was the first time that we have held a Women’s PSA event alongside the Men’s event. Home interest came from several locals as well as a number of Scots in the draw. Blair McKenzie lost out to Connor Sheen in 3 games, as did “The Famer” who lost out to Abhay Singh. Fiona Morrison was in action against Amy Jones, but also lost out in 3 games. However surprise of the day was when Morven White outplayed 4th qualifying seed Bruna Petrillo to earn a place in qualifying finals! Other Scots in the draw were Rory Stewart, Stuart George, Al Prott, Carrie Hallam, Katriona Allen, Maddie Orr and Lucy Murchie. Rory managed to squeeze past Nick MUlvey in 5 tight games, and Carrie defeated Charlotte Jagger in 4 games to both make qualifying finals. Qualifying continues today starting at 3pm – catch the action on out live stream(s) – see below for details! Blair McKenzie, club treasurer and Masters extraordinaire faced a stern test in Connor Sheen. Blair’s ‘short early’ playing style caught Connor a little unaware in the first game however Connor’s movement was more than up for Blair’s attacks as he settled in. 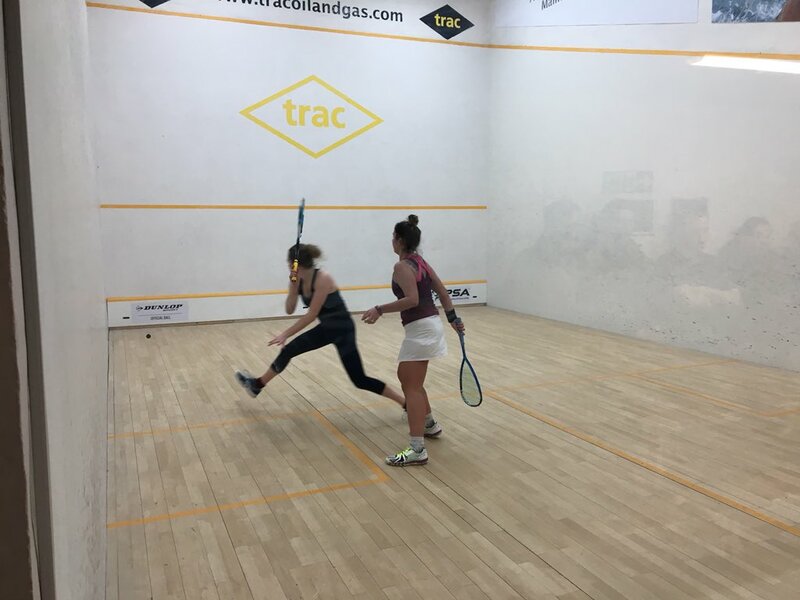 Top seed in qualifying faced off against Scottish top Junior Maddie Orr. Maddie acquitted herself well, got stuck in however Cindi’s fast tempo was too much this time. Weird match. Both players had something amiss; Rory was nursing a neck injury and Nick a stomach bug. Both pushed at different times in the match, and in the end Rory won. Lowri perhaps underestimated her opponent a little to start with. Robyn’s shotmaking and newly improved rapid court coverage saw her through in 3 tight games. Mike was on top throughout the first and arguably the second and third. Miles to his credit kept the pace very high and denied Mike the opportunity to hit the winners he wants to. The fourth and fifth became very tense as Miles imposed his physicality on the match, and in the end it was that physicality which paid off. Olga Kolarova was ranked WR44 in 2012 but took a break from the game. Her timing was perhaps a little off, especially on the backhand boast which is her go-to shot. Celine’s classy shotmaking was too much for Olga today. Fiona, an out and out lob-drop specialist, would often catch a lot of players out. Amy however was having none of it and made it through safely in a highly enjoyable encounter. Jami Aijanen played very well today. He struggled to read Jamie Henderson’s holds and flicks, however he was fast enough to get the shots back. Henderson found the tin a few times, and Aijanen kept the pace high enough to force a few more errors. Edinburgh local Carrie Hallam wasn’t sure if she was going to play this event. She’ll be glad she did as she put in a fantastic performance vs Charlotte Jagger, one of the top English juniors coming through. This was a contender for match of the day. Both players are similarly relentless, however Mark was controlling the middle for the majority of the rallies. Rob mixed in his usual style with some absolutely filthy backhand nick rollers and really made Mark work for a very tough 3-1 win. 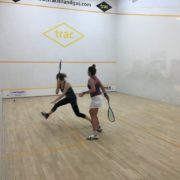 Local player and Scottish Junior Lucy wasn’t able to push polished professional Alicia Mead. More to come from Lucy, but today wasn’t her day. Brian Byrne and Alasdair Prott played in qualifying in this tournament this time last year. Brian certainly attacked more this year and showed Alasdair a lot of respect by going for every rally, making sure he is through in quick fashion. Morven agreed to step in at the last minute for this tournament. Doubting her chances in advance of the match, she then came alive and used her holds and movement to great effect, stunning the 4th seed in a surprise but deserved win. Joe and Stuart have already played in the ESC Open BSPA this year, with Joe winning 3-1. The fast court in Aberdeen suited Joe’s brutal length hitting and Stuart struggled to find openings to attack. One or two tins per game was all that separated these two and it was Joe who emerged victorious. Emilia and Kat are very similar players. Both are very quick around the court and look to attack on the volley as much as possible. It was maybe a bit of experience on Emilia’s side as she managed the 5th game a little better, but over all a brilliant performance from both players.